The heterojunction effects of TiO2 nanotubes on photoconductive characteristics were investigated. For ITO/TiO2/Si diodes, the photocurrent is controlled either by the TiO2/Si heterojunction (p-n junction) or the ITO-TiO2 heterojunction (Schottky contact). In the short circuit (approximately 0 V) condition, the TiO2-Si heterojunction dominates the photocarrier transportation direction due to its larger space-charge region and potential gradient. The detailed transition process of the photocarrier direction was investigated with a time-dependent photoresponse study. The results showed that the diode transitioned from TiO2-Si heterojunction-controlled to ITO-TiO2 heterojunction-controlled as we applied biases from approximately 0 to -1 V on the ITO electrode. In recent years, nanostructure materials have attracted much interest due to their remarkable physical and chemical properties. Among these nanostructure materials, TiO2 nanostructures have emerged as one of the most promising materials for optoelectronic devices because of the variety of growth methods and their high melting point (1,855°C), chemical inertness, physical stability, indirect band gap (3.2 eV), high photoconversion efficiency, and photostability. Based on its excellent optical properties, TiO2 has been utilized for many applications, such as photoelectrochemical water splitting , photoelectrochemical generation of hydrogen , dye-sensitized solar cells , and photocatalysis . Unfortunately, the inherent high band gap of 3.2 eV limits the optical application of TiO2. Therefore, most of the research efforts have been focused on modifying the material properties with the hope of enhancing the absorbability of TiO2 to extend from the ultraviolet (UV) region to the visible region through a doping process [5, 6]. However, in addition to modifying material properties, it is essential to understand and pay special attention to heterojunctions in the study of traditional semiconductors because the heterojunction effect determines a device's ultimate performance. Furthermore, when nanoscale materials are utilized, the heterojunction effects are magnified and become even more critical. For heterojunction semiconductor devices, the type of contact determines the carrier transportation direction, and the space-charge region and the potential gradient of a junction determine the magnitude of the photocurrent as the devices are illuminated by a light source [7, 8]. Therefore, apart from the modification of the intrinsic material, heterojunction studies of devices or sensors under UV light illumination should not be neglected. Wang et al. reported that N-TiO2/C heterojunctions could increase absorption in the visible light region and exhibit a higher photocatalytic activity than pure TiO2 . Zhang et al. reported that the heterojunction of Bi2MoO6/TiO2 shows effective separation of photo-generated carriers driven by the photo-induced potential difference generated at the Bi2MoO6/TiO2 heterojunction interfaces . Lee et al. reported that a TiO2/water solid-liquid heterojunction exhibits a high photosensitivity, excellent spectral selectivity, linear variations in photocurrent, and fast responses with ultraviolet . As mentioned above, the study of TiO2 heterojunctions has focused on single heterojunctions. However, there are two heterojunctions in many devices, such as solar cells . Therefore, more studies in this field are necessary, especially in nanostructure systems. In this research, we employed an anodic aluminum oxide (AAO) template and atomic layer deposition (ALD) nanotechnology to prepare TiO2 nanotube arrays. A thin ITO electrode was deposited on top of the TiO2 to form a Schottky contact , and the heterojunction effects on the photoconductive characteristics of TiO2 nanotubes under forward and reverse biases were investigated. To explain the change of the carrier transportation direction, we discussed the mechanism using an energy band diagram. To fabricate TiO2 nanostructures, first, AAO was prepared on p-type (100) silicon substrates with two-stage anodization. The detailed fabrication process for the AAO was presented elsewhere . The diameters of the AAO pores are 70 nm. In particular, the AAO barrier has been removed after the pore widening treatment so that the deposited TiO2 nanostructure can adhere to the substrate after the removal of the AAO template. To deposit the TiO2 nanostructure by ALD, Si substrates with the AAO templates were first placed into a quartz tube reactor with the operating environment maintained at 1.6 × 10-1 Torr and 400°C. The precursors of TiCl4 and H2O, kept separately in a canister at 30 ± 1°C and 25 ± 1°C respectively, were used as Ti and O sources, respectively. Pure Ar gas (99.999%) was used as a carrier gas and purge gas. To prepare TiO2 nanotube arrays, a 300-cycle deposition parameter was introduced. Each deposition cycle consisted of eight steps, which included TiCl4 reactant, pump-down; Ar purge, pump-down; H2O reactant, pump-down; and Ar purge and pump-down. Typical pulse times for the TiCl4 and H2O precursors were 1 s, and the purge time was 3 s. To remove the residual reactants and by-products efficiently, the pump-down process was added after each step. Then, with mechanical polishing, the TiO2 film on the top surface of AAO was removed. Finally, the AAO template was selectively removed by a 0.1 wt% sodium hydroxide (aqueous) solution, and TiO2 nanotube arrays were fabricated on the Si substrate. Highly ordered self-aligned TiO2 nanotubes can be fabricated using the template of (AAO) on p-type (100) Si substrates and the ALD technique . To prepare TiO2 nanotube arrays, a 300-cycle deposition parameter was adopted. An ITO film (450 nm) and Al film were chosen as the electrode and the back electrode for ohmic contact and were deposited using an e-gun evaporation system and a thermal evaporation coater, respectively. The current characteristics of the specimens were recorded by a Keithley 2400 sourcemeter (Keithley Instruments Inc., Cleveland, Ohio). Due to the measuring requirement, a small voltage of approximately 10-6 V is applied automatically by the Keithley 2400 sourcemeter when the equipment is set up to 0 V bias. Nevertheless, it is regarded as a short circuit (approximately 0 V) condition because 10-6 V can be considered negligible. To perform the study, the photoresponse was measured under UV illumination of approximately 21 mW/cm2 (λ = 365 nm) in air at room temperature. A field-emission scanning electron microscope (FESEM JSM-6500 F, JEOL Ltd., Tokyo, Japan) and transmission electron microscopy (TEM) were utilized to examine the morphology of the TiO2 nanotube arrays. To understand the ITO/TiO2/Si diode structure, we used scanning electron microscopy (SEM) and TEM to analyze the structure. Figure 1a shows the cross-sectional SEM image of TiO2 nanotubes with an ITO electrode deposited on top. No residual AAO template was observed. The nanotubes are perpendicular to the Si substrate and are in good contact with the ITO. The height of the TiO2 nanotube arrays is 485 nm. The plan view TEM image of the TiO2 nanotubes is shown in Figure 1b. The average wall thickness of the nanotubes is measured to be 17.3 nm, and the thickness appears to be very uniform. Figure 1c presents the cross-sectional TEM image for the TiO2 nanotubes on a Si substrate. The average diameter of TiO2 nanotubes is 70 nm. Cross-sectional SEM and TEM images and plan view of nanotube arrays. Top image, cross-sectional SEM image showing the fabricated TiO2 nanotubes with an ITO electrode on the top surface. Center image, plan view TEM images of TiO2 nanotube arrays. Bottom image, cross-sectional TEM images for the TiO2 nanotube arrays. I-V characteristics of the ITO/TiO2/Si diode are presented in Figure 2. Embedded in the graph is a measured schematic diagram which shows that a positive bias is applied to the ITO electrode. When a positive bias is applied to the ITO, the ITO-TiO2 heterojunction is under a forward bias; nevertheless, the TiO2-Si heterojunction is under a reverse bias. The rectified current characteristic of the photodiode is observed in the dark environment, which is the same as the traditional I-V characteristic of a p-n junction at a reverse bias . Therefore, the reverse-biased rectification properties highlighted the fact that the TiO2-Si heterojunction at a reverse bias dominated the performance of carrier transportation. 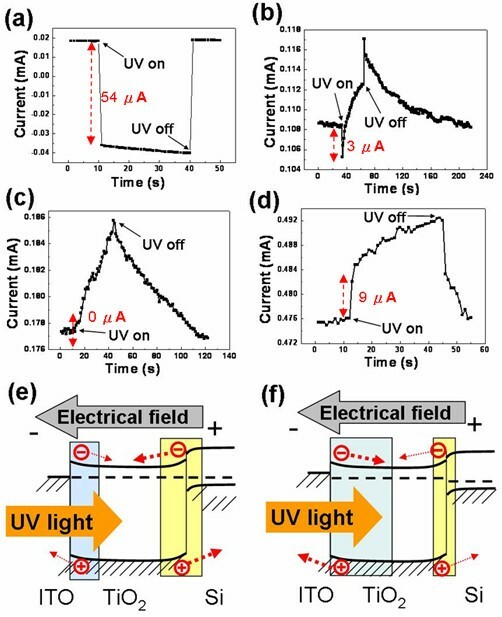 In Figure 2, we also observed that when UV illumination was applied, the photocurrent exhibits a flattening in the I-V characteristics above 0.3 V. The flattening of the curve occurs because the space-charge region of the TiO2/Si heterojunction may extend to the entire TiO2 nanotube array. Therefore, the photocurrent reaches saturation when the voltage is 0.3 V. In contrast, the photocurrent gradually increases with the increase in the negative biases. That is, the ITO-TiO2 junction was under reverse bias. With increasing negative bias, the ITO-TiO2 junction may become larger, which may contribute to the photocurrent. A detailed discussion will be provided later in the text. I-V characteristics of the ITO/TiO 2 /Si diode with a positive bias on the ITO electrode. The embedded drawing shows the experimental setup. Figure 3a, b shows the short circuit current under on/off UV illumination cycles as a function of time when ITO is connected to the positive electrode and Si is attached to the negative electrode. Because the current is recorded once per second and it allows enough time for the photoreaction to stabilize [17, 18], the short circuit (approximately 0 V) current at each UV on/off cycle is steady and reproducible. To further explain the short circuit photoresponses, the energy band diagrams for the heterojunctions are introduced to illustrate the photocarrier transportation directions. A detailed discussion of the energy band diagrams was presented in a prior study . 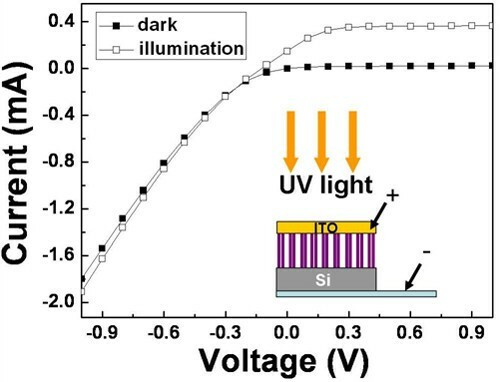 Under UV illumination, photocurrents with opposing directions were generated from two space-charge regions located at the TiO2-Si heterojunction (p-n junction) and the ITO-TiO2 heterojunction (Schottky contact). When the ITO electrode is connected to the positive electrode, the positive photocurrent (0.13 mA) shown in Figure 3a has the same direction as the electric field, as shown by the thick dotted arrows in Figure 3c. When the negative electrode is connected to the ITO, the directions of the photocurrent (-0.13 mA) and the electric field are opposite, as shown in Figure 3b, d. Both cases indicated that the TiO2-Si heterojunction dominated the photocurrent transportation direction, as shown in Figure 3d. In addition, the same absolute magnitude of the photocurrent also indicated that both cases come from the same generating source. Again, we confirm that the TiO2-Si heterojunction, owing to its wider space-charge region and larger potential gradient, dominated the photocurrent transportation direction and photocurrent magnitude, in agreement with the results of the I-V characteristics in Figure 2. Short circuit current as a function of time under on/off UV illumination cycles. The short circuit current as a function of time under on/off UV illumination cycles when a positive bias is applied to the ITO electrode (a) and when a negative bias is applied (b). Figures (c) and (d) are the corresponding energy band diagrams with respect to (a) and (b). Figure 4a, b, c, d shows the time-dependent current for the ITO/TiO2/Si diode under UV on/off illumination when negative biases from approximately 0 to -1 V were applied to the ITO electrode. As the UV light source was turned on, the magnitude and the direction of the current changed from 0.018 to -0.036 mA at -0.1 V. As mentioned in the short circuit (approximately 0 V) condition above, this phenomenon means that the TiO2-Si heterojunction still controls the photocarrier transportation direction, even at -0.1 V bias. According to the classical knowledge in semiconductors , it is known that when a negative bias is applied to the ITO electrode, the TiO2-Si heterojunction and the ITO-TiO2 heterojunction are under a forward bias and a reverse bias, respectively. It is also known that the width of the space-charge region and the potential gradient are enlarged at a larger reverse bias, whereas they are narrowed at a larger forward bias, as shown in Figure 4e, f. Therefore, for short circuit -0.1 and -0.4 V bias, the net photocurrent change from 'off' to 'on' UV illumination was decreased from 0.13 to 0.054 mA and to 3 mA due to the narrowed space-charge region and the potential gradient at the TiO2-Si heterojunction under a forward bias, as shown in Figure 4a, b. The decrease in the current at the moment from off to on UV illumination means that the TiO2-Si heterojunction is still dominant in those cases. In addition, the current increased after UV was shut off. This phenomenon may be attributed to the escape of photocarriers trapped by the defects in the heterojunctions. With larger biases, trapped photocarriers were discharged more easily in a short time. Time-dependent current for the ITO/TiO 2 /Si diode under UV on/off illumination. Time-dependent current for the ITO/TiO2/Si diode under UV on/off illumination when the following biases are applied to the ITO electrode: (a) -0.1 V, (b) -0.4 V, (c) -0.6 V, and (d) -1 V. (e) and (f) are the energy band diagrams in the short circuit condition and at a negative bias, respectively. Although the fast photoresponse can be observed at the UV on/off moment, the gradual increase and the slow recovery of the photocurrent under UV on/off illumination were recorded when the bias was -0.4 V. However, when a -0.6 V bias was applied, no net photocurrent magnitude was observed under UV illumination, except for the gradual increase and slow recovery of the photocurrent, as shown in Figure 4c. This phenomenon means that we have reached the transition point because the photocurrent generated from the ITO-TiO2 heterojunction was enhanced at an increased reverse bias, whereas the current generated from the TiO2-Si heterojunction was reduced at an increased forward bias. The two currents reached equal magnitudes at the transition point, thus canceling each other out. After the bias was enlarged to -1 V, the current was increased from 0.476 to 0.485 mA under UV illumination, as shown in Figure 4d. 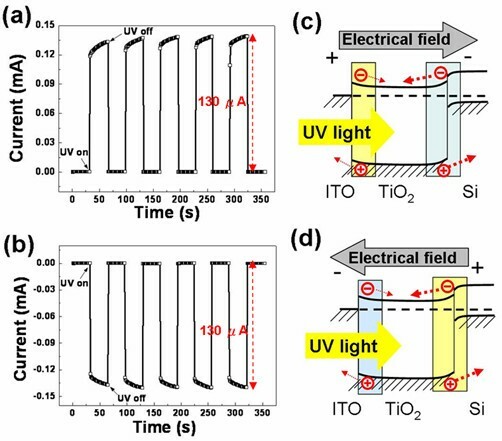 The photocurrent originating from the ITO-TiO2 heterojunction was large enough to counteract the effects of the photocurrent resulting from the TiO2-Si heterojunction, finally governing the photocarrier transportation direction. However, the gradual increase and slow recovery in the photocurrent were still observed. Nevertheless, the important finding of our study is that we have observed that the transition point of the photocurrent transportation direction changes from TiO2-Si heterojunction-controlled to ITO-TiO2 heterojunction-controlled and from short circuit to -1 V.
where rTiO2 is the dimension of the TiO2 nanotubes and tTiO2 is the wall thickness of the TiO2 nanotubes. The voltage of the transition point is -0.6 V when the heterojunction area ratio is 4.1. The voltage at the transition point may decrease as the junction area ratio decreases. Nevertheless, further studies are required to clarify this point. In summary, we studied the heterojunction effects on the UV photoresponse of TiO2 nanotubes fabricated by ALD on a Si substrate using ITO as the electrode. In the short circuit (approximately 0 V) condition, photocurrents of 0.13 and -0.13 mA were measured when the positive and the negative electrodes were connected to the ITO, respectively. When a negative bias was applied, the net photocurrent changed from off to on and UV illumination decreased from 0.13 mA to 3 μA as the negative bias was decreased from short circuit (approximately 0) to -0.4 V. The photocurrent reached a transition point when -0.6 V was applied, which is where current generated by the ITO-TiO2 heterojunction equals the current generated by the TiO2-Si heterojunction. These intriguing results may be attributed to the depletion regions in the ITO-TiO2 and Si-TiO2 heterojunctions. More studies are needed to clarify which heterojunction dominates the photocurrent. The authors would like to thank the National Science Council of the Republic of China, Taiwan, for the financial support of this research under Contract No. NSC-96-2628-E-009-010-MY3.